We check over 450 stores daily and we last saw this product for $1,207 at Last Call. Belpearl stud earrings. 14-karat white gold hardware. Round white diamond in five-point prong setting at post. 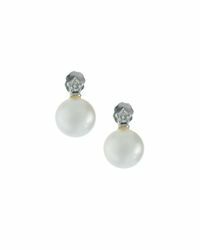 Round, naturally white freshwater cultured pearls. 0.20 total diamond carat weight. Pearl dimensions: 10mm. 0.6"l drop. Post backs.